The town seems to be as economically isolated as it is in all other ways. The DOD funds Global Dynamics, but otherwise it would appear to be a money-less society: houses and businesses are built and rebuilt, vehicles are upgraded and replaced frequently, tech is freely borrowed and re-purposed, the bank contains technical and personal artifacts. Most notably food from Cafe Diem is explicitly free. Everyone in town seems to have their own niche job with no competition. In fact I don't recall money ever being mentioned other than the government funding GD. So is the lack of money just an oversimplification of a company town, or there some kind of communal economy in effect? Have the creators ever addressed this? Jack Carter certainly receives a salary (explictly mentioned in the Pilot episode when he's advised that his new job as 'Sheriff of Eureka' comes with both a promotion and a pay rise) and Zane Donovan gets into trouble for removing funds from Eureka's bank to give to his old Teacher in the episode "E = MC...?" so clearly they don't live in a totally cashless environment. Some of the stores on the main street do seem to be offering "sale prices" and low-interest financing so it seems the idea of Eureka being a "commune" boils down to the subsidised canteen. Not the answer you're looking for? Browse other questions tagged economics eureka or ask your own question. Did they goof mixing Warehouse 13 and Eureka universes? Can Eureka and Warehouse 13 exist in the same universe? Was Sheriff Carter recruited to come to Eureka? Who were the people leaving Eureka in the first episode? Is Eureka inspired by a real place? In Eureka series 5, how come the crew of the Astraeus don't notice? 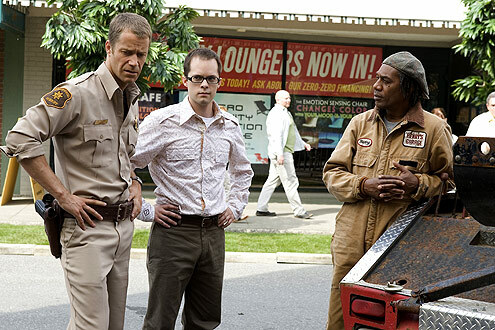 In Eureka Season 2, does Henry Deacon remember the circumstances of Kim Anderson's death?